On Wednesday 13th November, Notts County Unison held a protest at County Hall against the cuts being proposed at Nottinghamshire County Council. The council reverted to Labour control in May, but this has made little difference to the austerity programme in the county which continues apace. DEFEND COUNCIL TAX BENEFIT LOBBY AND RALLY, TUESDAY 18 DECEMBER 2012, Nottingham City. Lobby: Loxley House, Station Street 12.30pm. Rally: Nottingham Market Square 5.30pm. In response to the Notts SOS petition with over 1700 signatures submitted in March 2012 prior to the Nottingham City Council 2012-3 budget setting meeting, against cuts to services, we have received a letter from Tony Kirkham, Director of Strategic Finance (please note any errors in the scanning of the printed letter to text are ours). Feel free to add your thoughts and comments. response to the issues raised within your petition. Under the 1992 Local Government Act the Council is required to calculate its budget requirement for each financial year and budget to meet its expenditure after taking into account other sources of income. The 2003 Local Government Act also places an explicit obligation on the Chief Finance Officer (CFO) to report on the robustness of the budget. Within the legal framework outlined above the City Council’s budget has been set in response to a challenging financial situation. 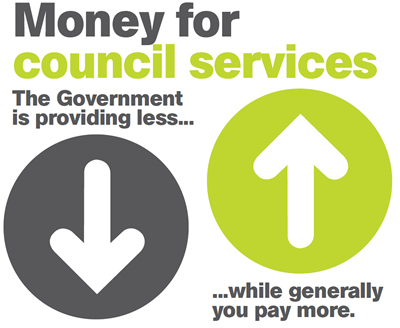 Above average cuts in Government funding (7.4% in 2012/13) and other pressures means the City Council has had to take difficult decisions on the kind of services it can continue to provide. A further £20m of reductions will be made in the budget above and beyond those already implemented in the recent past. Our priorities include supporting jobs and the local economy and protecting services for vulnerable people where it can – although growing numbers of people needing adult care and children in care add further pressure on the council’s finances. To meet these pressures the City Council has been looking at how it delivers services and either finding more efficient ways to do so or, in some cases, stopping services where demand has fallen. The City Council has decided to increase its Council Tax for 2012/13 by 3.4% because it, like a number of other authorities across the country, does not believe that it would be financially responsible to “freeze” council tax at the current level as this would result in significant on- going pressures in future years budgets. If we had accepted the Government’s Council Tax ‘freeze’ grant for 2012/13 there would have been a significant negative impact on the City Council’s budget position for 2013/14 onwards. The Government’s proposed Council Tax Freeze Grant for next year would involve a single one-off payment with no further funding locked into future financial settlements. This would have had an adverse future impact on our services and priorities; the City Council would either have had to increase its council tax by c6.0% in 2013/14 or find additional savings of £3.5m on top of the Medium Term Financial Plan assumptions of a 2.5% Council Tax increase. For this important reason Nottingham, like a number of Councils across the country including locally Gedling Borough Council, has not accepted the Government’s offer to freeze our level of Council Tax in 2012/13. As part of the budget setting process consultation is carried out with a range of interested parties. For 2012/13 consultation on the budget was conducted in two phases. Before the budget settlement was announced, pre-budget consultation was carried out with citizens and with the voluntary sector. An insert into the residents’ magazine, the Arrow, in Autumn 2011 included a survey, which was also available online. In addition, a series of local consultation events were held, attended by local councillors and, where possible, by an Executive Board councillor. The draft budget was considered by Executive Board on 17 January 2012 and this was followed by further consultation. Due to the need to feedback to the 21 February Executive Board meeting, this consultation could not be run through the Arrow. Instead, citizens were invited to comment via the Council website. Additionally, further local events were arranged and Neighbourhood Management teams publicised these locally. Voluntary sector consultation has continued alongside this as well as consultation with Council colleagues and business. Appropriate action has been taken in relation to any representations made and feedback from that consultation process has been taken into account in finalising the proposals approved by Full Council on 5th March 2012. In January this year, the City Council wrote to the Secretary of State, Eric Pickles, explaining the future financial difficulties it would face if it accepted the Government’s grant on a one-off basis and asked it to consider funding the freeze on the same basis as 2011/12. The Government has however, responded by saying that they are not willing to change back to the previous system. I hope that the information provided has been helpful in explaining why the background to the difficult decisions that the Council has had to take in setting the budget for 2012/13. If you require any further information please feel free to contact me again. This is the latest update from Nottinghamshire Save Our Services (Notts SOS). not relenting (indeed they’ve just announced plans to further attack public sector workers by abolishing national pay arrangements) and neither will we. We meet every two weeks. The next meeting will be Monday 26th March. Meetings start at 7.30pm and are held at the International Community Centre, Mansfield Road. Meetings are usually finished before 9pm and there’s often an opportunity to carry on any discussion informally in the pub afterwards. Please do come along and get involved. but on Thursday the occupiers were informed that the judge had granted them a 3 week adjournment until 5th April. On Saturday 24th March there will be a benefit night for Occupy Nottingham at the Sumac Centre. This will include Dub Reggae, Ragga Bashment, D+B, Dubstep & Jungle Bizness! 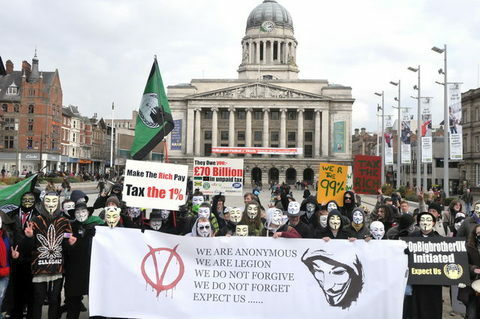 All in aid of Occupy Nottingham! Headliner: YT (SATIVA RECORDS) + DJ’s: Shrug Knight; Buda; Vinyljunkie; Remington; Spread; Jake5nake. £4 on the Door!!! Food will be available at ‘Peoples Kitchen’ from 6.30pm, a great vegan meal for a small donation to Occupy Nottingham, it is hoped that there will be an open forum discussion before hand from 5pm. Wednesday 28th MarchPossible national strike action over pensions by PCS and NUT (and maybe other unions). Friday 27th April, 7.15pm-lateNotts Trades Council May Day social. The Polish Eagle Club. £5 on the door/concessions. Saturday 5th May, 10amMay Day march from the Forest Recreation Ground for a rally in the Market Square. Speakers to include Mark Serwotka from PCS. Campaigners from Nottinghamshire Save Our Services (Notts SOS) have condemned the budget, voted through by councillors on Monday 5th March. Councillors overwhelmingly voted for the budget which included a 3.49% council tax increase; the sell-off of Portland Leisure Centre; the closure of two centres for older people, Marlstones Elderly Person’s Home in Bulwell and the Willows Centre in Beechdale; the closure of the Museum of Nottingham Life at Brewhouse Yard; the ending of food waste collections and closure of nine recycling centres; and a reduction in funding to Connexions, a support service for young people. There were only four votes against – the city’s few remaining Tories voting who have no particular objection to cutting services, but opposed the council tax increase. Notts SOS held a joint protest with Nottingham City Unison outside the Council House at lunchtime and another for people coming from work at 5pm. The group also handed in a petition to the council calling on the council not to implement a cuts budget. This was presented by Councillor Alex Norris during the budget meeting. a 1,200 strong march to the city centre in November 2010.